We just got introduced episodes 1-10 -- I decided to do episodes 11-20 for this entry. This would be where things start to charge direction a little earlier. I would like to discuss this week's episodes which also includes a bit of direction change -- but not too much. Want to know what it means? Just read on then I may write on episodes 21-30 next! 11 -- I think about this episode to contain one of the most crazy Deathdark Plots ever. Since when did a lion breathe and produce fire? Lion Mozoo is tasked with the task of burying Japan by making volcanoes explode. A Miki focused episode where she works together with a boy and his grandfather. The volcano eruption plan could have also been done this way. If you saw the Dinosaurs sitcom (which was during the 90s) -- Deathdark could have thought of using it to produce super-thick clouds which could block out the sun AND lead the Earth to an ice age. Hmmm... Deathdark could have thought of that to! 12 -- Liar, liar pants on fire! Is it me or is Hirohisa Soda really that fond of writing the lesson of the week? He practically did write a moral lesson of the week in episodes 2, 3 (about friendship), 4 (about not being perfect), 5 (the value of nature) and 10 (not to pursue innovation for one's own glory) and now he's back to doing it again. This Goggle Yellow focused episode focuses on a boy who's always making up stories. It's almost like a modern rendition of the Boy Who Cried Wolf. When he talks about the arrival of Antlion Mozoo -- nobody believes him anymore. It's a painful lesson that could have had gotten the boy killed. Fortunately, the boy makes it out alive. 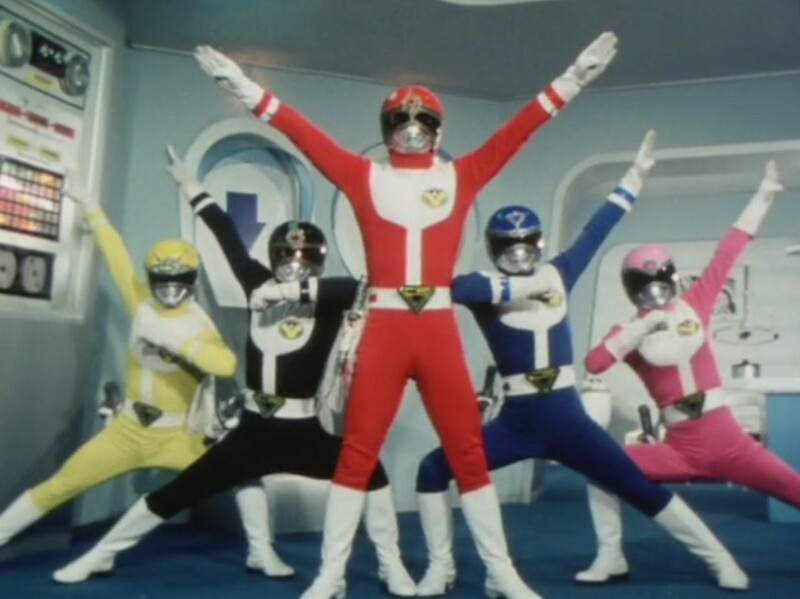 Speaking of which, you'd probably find this one repeated in Fiveman episode 14 and Carranger episode 18 -- both written by Hirohisa Soda (who also wrote episodes for Carranger after he no longer worked as a head writer) and yellow-focused too! 13 -- After last week where we had Goggle Yellow -- it's Goggle Yellow again. This time, it's about Futoshi's long lost father who ended up prioritizing gold over family. It's a sad story but there's one lesson here -- no matter what wrong he's done -- that man is still his father! Yes, I really felt this episode was once again a moral lesson of the week about family, forgiveness and finances. Futoshi nearly loses his father who he was seeking. He held a grudge for leaving him and his mother behind. Yet both managed to reconcile at the end. Not so many get that chance if you ask me! 14 -- Trying to create the Water World movie anyone before it was even filmed? Both Igaana and Zazoriya are deploying Angler Mozoo to use his deadly heat ray. Miki wants to have her mirror polished because it's not working against the heat rays. Also, what's interesting in this episode is that the famous mirror polisher was duped by Deathdark into polishing a ray that they want to use for one wicked scheme -- melt the polar ice caps! The whole Earth would be flooded! This episode also started showing what could be the problem with some old school series -- budget cuts! Yes, Fuehrer Taboo is already shown to be very angry towards Igaana and Zazoriya for repeated failures. What? It's only been 14 episodes and these guys are getting their death threats? Honestly, is it me or is there some payroll issues going on? The next episode would wrap it up. 15 -- Deathdark heads its Deathtopia fortress to the South Pole to revive Ambassador Hell's missing twin brother or cousin or whatever (just joking) namely Deathmark. He appears as one creepy undead commander who looks like a repainted version of Ambassador Hell from the first Kamen Rider. He gives Igaana and Zazoriya a chance to prove themselves -- by bringing the life extract of a human. They end up getting the life extract of the Computer Boys namely Tatsuya who becomes an old man as a result! I don't know but is it me or is sending Igaana and Zazoriya on a rather menial task to get life essence from humans not really the best way to dispose of them? 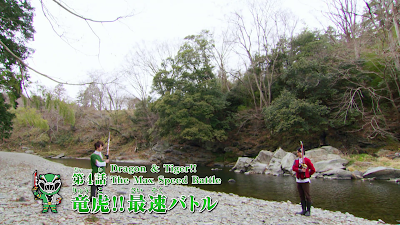 I was thinking that Fuehrer Taboo could have sent both of them on a do or die mission -- you know, something like what Ragorn did to his generals in episodes 27-29 (or 28-30 if you count the clip show) of Turboranger. It could be interesting to see Igaana and/or Zazoriya challenge the Goggle V team to the very last blood. Sigh, instead they are later teleported back and destroyed by Deathmark at the command of Fuehrer Taboo. IMHO, I would have wished Fuehrer Taboo show how frightening he can get by destroying both idiots himself. This episode also gets interesting with how the rivalry of Deathgiller and Goggle Red. Deathgiller uses the life essence of Tatsuya as a bargaining item. I like how the two engage in a more prolonged sword fight. Heck, he even refuses the assistance of Mazurka and Bee Mozoo! The Goggle V managed to save their teammate but they also realize that Deathmark is now their new enemy to contend with! 16 -- This episode gives me the creeps even if all the starfish are obviously fake. Starfish Mozoo is launched to devour as much energy as possible. Goggle suits? Useless! Goggle machines? Goggle Caesar? All useless. Energy is constantly devoured and Japan could return to the stone age anytime. I find this to be an episode that shows how deadly Deathmark can get and why he's feared among Deathdark. This episode also has the Goggle V offering to deliver a vial of blood but they can't do it out of suit. The starfish would follow them as long as they are in suit. Kenichi goes out of suit and he's pursued by his rival Deathgiller and Mazurka. They want to make sure that the blood is never delivered to a child in help. This really shows how badass people can get even when out of suit. I love this episode also for its cheap tactic used against Starfish Mozoo. The starfishes go after where there's more energy. They use it against the monster which allowed them to defeat it. So why wasn't there a Starfish Kong? Was it because Starfish Kong had no hands or fingers to pilot it? I wish the writers and producers will explain why there was no giant robot battle for this episode. Or did Deathdark get too frustrated that they forgot to launch the giant robot? You decide? 17 -- Deathdark plans to turn all of humanity into Kappas. The modus operandi would involve humans getting kappa plates stuck on their head. The weakness is that every time the kappa plate is hit -- the humans turned into kappas revert back into normal. This is part of some scheme to get humans to destroy each other. At the same time, it made me think why didn't Deathdark think of well, turning the Goggle V members into kappas and destroy each other? There's also the child of the week who befriended a kappa in the past. The Kappa Mozoo gets the Kappa Plate which was an important family heirloom. A boy manages to break the power of the Kappa Plate by actually talking to the spirit of the Kappa during the near end of the episode. The Kappa Plate is taken back and given back to the family. The episode ends with the Goggle V team swimming. 18 -- Do you want to be young forever? This is one innovative feature that would feature great risk. A scientist wants to prevent humans from growing old but this comes with some consequences. Deathdark seeks to use the potion to turn everyone into children! They deploy Monkey Mozoo (who looks like a mutated version of Sun Wukong) to Japan and spread the gas. 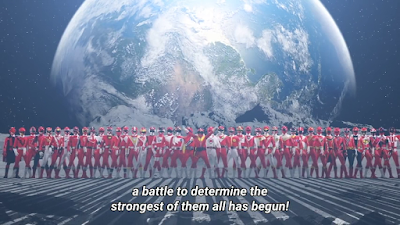 People are turning into children -- this plot would later be reused in Turboranger but with a more hilarious twist. The Deathdark wants to produce more of it so they kidnap the scientist and his father. This also involves a dog who somewhat plays a role in this episode. They are looking for some microfilm that contains the formula. It also has me thinking that is it me or is Deathdark that stupid? I mean, they could have sprayed the Goggle V team with the youth potion AND kill them after that? Really Deathdark? I guess the stupidity of the villains is what keeps the show running and entertaining. The end of the episode has the scientist revealing a lot. The microfilm wasn't in the dog but in a shell necklace. He also burns out the youth potion realizing that death is part of life. But I wonder did destroying the monster bring everyone back to their proper age or not? 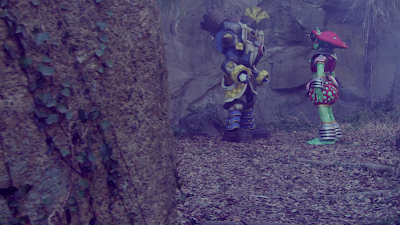 Toku does have a vague rule about monsters and their spells disappearing when they're destroyed. 19 -- It's a haunted house experience and what better Mozoo to have than Bat Mozoo? It's a plan to get people to be paralyzed so Deathdark can win. So really? Why didn't Deathdark take the opportunity to inflict one of the Goggle V or the whole team with said poison? This has a boy's drunken father missing and they send him to the hospital for treatment. But they need some antidote which again sets the rule -- why is it that some monsters that get killed would cause their victims to get healed and why doesn't it work all the time?! You've got weird logic there, right? The Deathdark wants to produce more of the dangerous toxin that will paralyze people. Kanpei manages to get a sample of the antidote. This also has a touching ending -- the boy's father sounds like he's going to stop getting drunk and work hard from then on. I hope he meant it! 20 -- An episode that may end up getting to me especially that I'm a fan of Mexican food and cacti to a certain extent. Cactus Mozoo spreads a deadly cactus that will turn people into cactus. Really, what's with this half-brained experiment? People are turning into cacti every time these flowers bloom. Goggle V contacts a cactus specialist known as Teresa. Two children with a dying cactus from Mexico also seek her help. This episode also features Miki's use of a rather weird technique. She disguises herself as a flamenco dancer and takes advantage of the monster's weakness for liquor. IMHO, it could have been funny if he got tricked into drinking the antidote and his body becomes the herbicide that will kill the deadly cactus. What I like about this episode is that we see the people actually get rid of the evil cacti and that Cactus Mozoo's death didn't cause them go away. However, a future episode would do that kind of twist which I'll soon discuss some other time!